I write a lot about how UK IT professionals are often replaced by workers from overseas using Intra Company Transfer (ICT) visas. These workers are attractive to UK businesses because they cost much less. But there is also a huge tax advantage for these workers that means they can afford to come to the UK on minimum wages. Not only do workers in the UK on ICT visas get more of their money, the UK government gets less. The way expenses are bundled with salaries and how the tax is calculated means government attempts to raise the minimum salaries required for these workers are futile. In the current situation UK IT workers who pay a lot of tax are being replaced by offshore workers that don’t pay much if any at all. If you click on this link you can see all the statistics, as presented by the government, for the total number of immigrant workers by occupation, the total number using ICTs by occupation and the total number using ICTs by nationality. These show all occupations but IT stands out as a major recipient of immigrant workers. Because it is complicated Migration Watch has provided me with a summary of the problem. Migration Watch is calling for a change to the taxation rules. 1. Tax and National Insurance rules are heavily biased towards ICTs to the dis-advantage of UK workers. 2. Intra Company Transfers (ICTs) have been excluded from the government’s cap on economic migration. Their numbers have been significant in the recent past, rising from 22,000 in 2008 to 29,000 in 2009. 3. Meanwhile, there have been some significant changes to this route. The salary threshold for a visa valid for up to 5 years has been raised to £40,000 while a new visa has been introduced, valid for 12 months in a 24 month period, for those earning between £24,000 and £40,000. The latter are unlikely to show up in immigration figures which include only those who arrive for more than 12 months. 4. In recent years only 50% of ICTs have earned salaries of £40,000 or more. This might suggest that the numbers will fall to around 15,000 visas a year. However, there are very significant financial advantages for both the employer and the migrant worker so the numbers could increase considerably. a) No National Insurance is payable for the first year by either the employer or the employee. b) Accommodation allowances can make up to 30% of the salary. Other “cost of living” allowances mean that over 70% of the salary can be in the form of allowances. These allowances are not subject to income tax for the first two years. c) The salary offered is supposed to be consistent with the going rate in the UK so as to prevent British workers being undercut. For this purpose, each Standard Occupation Code (SOC) has a minimum salary. However, the UKBA accepts the lower quartile of salaries based on the UK as a whole. Thus it is perfectly legitimate to offer a salary for a job in an expensive area like London based on the bottom quartile of salaries for the whole of the UK. 6. For example, the average salary of a UK programmer in London is £32,820while the average salary of an Indian IT programmer sent to London in December 2010 on an ICT visa was £27,981 with allowances making up an average £21,139 or 75% of the salary. This basic salary, excluding allowances, is well below the minimum wage level. 7. 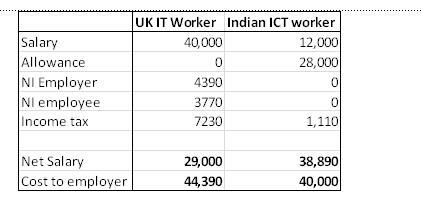 Table 1 below shows the breakdown of costs and net pay for a UK worker and Indian ICT worker for the first year of employment, each with a salary of £40,000; the ICT worker received 70% of salary in the form of allowances. 8. The UK worker takes home £29,000 from his £40,000 salary and £15,390 is paid in tax while the cost to the employer of the salary plus their NI contribution is £44,390. However, if the same employer hires an ICT worker, the take home pay of the employee is £38,210, the total tax paid is only £1105 and the cost to the company is only £40,000. So for a salary of £40,000 the company saves over £4,000 in costs and £14,000 of tax revenue is lost. The employee also gets to take home an extra £10,000 a year which perhaps explains why they are happy to be brought in on salaries that appear to be well below the going rate. 9. After the first year the national insurance is paid but it is only on the non-allowance component of the salary. Table 2 below sets out the costs for the second year. 10. These financial advantages to a company in hiring an ICT worker rather than a UK worker incentivises a company to replace UK workers on cost grounds and means that the numbers of migrants in this uncapped category have the potential to grow substantially. Changes to the taxation rules to create a level playing field are essential. I think that is mostly accurate, but I don't think all of a £28k allowance would be tax free. I have seen it up to £18k tax free and the rest taxed. So that would be another £2k income tax paid by the ICT. So the loss to the tax man would be £12,000 instead of £14,000. I see little indication that numbers will fall! Surely the exemption of ICTs from any numerical limits doesnt exactly suggst that numbers will fall. Especially as cuts bite and every manager is looking for cheap outsourcing. As a signficantly lower salary is required for short term workers, so these are likely to be used more, some analysis of figures for that circumstance would be useful. There is an international trade commitment dimension to this, as we head into an EU (but mostly UK)/India Free Trade Agreement, where access for Indian workers is the central concession being made by the EU (but to the UK). In relation to this, it is necessary to look outside of Tier 2, to Tier 5. There, hidden amongst 'religious workers, charity workers and sportespersons', there is 'international agreements'. This category, which, like 'ICTs' in Tier 2 is without numerical limits, is escaping attention. Yes, the Indians and the ICT abusers are ripping off the system, taking jobs from British people, decreasing pay expectations for those British people lucky enough to be in jobs, placing a burden on this country's infrastructure and so on, all while paying minimal amounts of tax. You can hardly blame them though, because this and the previous brain dead witless governments make it so easy for them. Very few of the very many ICT people that I have worked with in recent years have stayed more than 6 to 9 months at a time. I would say that 99% of them are here for 3, 6 or 9 months at a time. Then they go home for a few months and then return for a further stint. Generally they are supplied in rotation. Therefore any legislation constructed around a twelve month time-frame will have little or no effect, at least within the companies I have worked. Another good article Karl, keep 'em coming. About time these practises were exposed to the light. Now all we have to do is convince someone to act on this information. I think I am about to get my hands on a goldmine of controversial information about this. Watch this space. Thanks for publicising this issue again, Karl. It's worth bearing in mind that many ICTs are brought in by the major consultancies with bases offshore, i.e. precisely the same "oligarchy" that is "ripping off" the government over public sector IT (Computer Weekly, 15 March). So we have the situation where many ICTs end up working on government projects, being paid significantly less than their UK equivalents, paying little or no tax in the UK, often spending relatively little here as well, but still being charged out to the UK taxpayer by the "oligarchs" at two or three times the cost of an equivalent permanent UK-based employee or contractor. And at the end of all that, the final systems delivered by the "oligarchs" are still rubbish. The WTO EMPHASISES that this is a mechanism that can ONLY be used by transnational firms. So another dimension of how these rules are shafting not only UK workers, but also the UK economy, is how SMEs and national-only firms are distinctly disadvantaged in relation to transnationals, through this mechanism. TNCs can access cheap labour while SMEs, who employ most people in the UK, can't. Glad that the international trade agenda delivers a 'level playing field'! and it's not as if they're even any good and certainly not better than our home grown guys, as anyone who has tried to pick the bones out of their shoddy code or tried explaining something with their generally appalling English.